Spring is in the air! It’s time to shake off the winter rust and get back on the diamond. 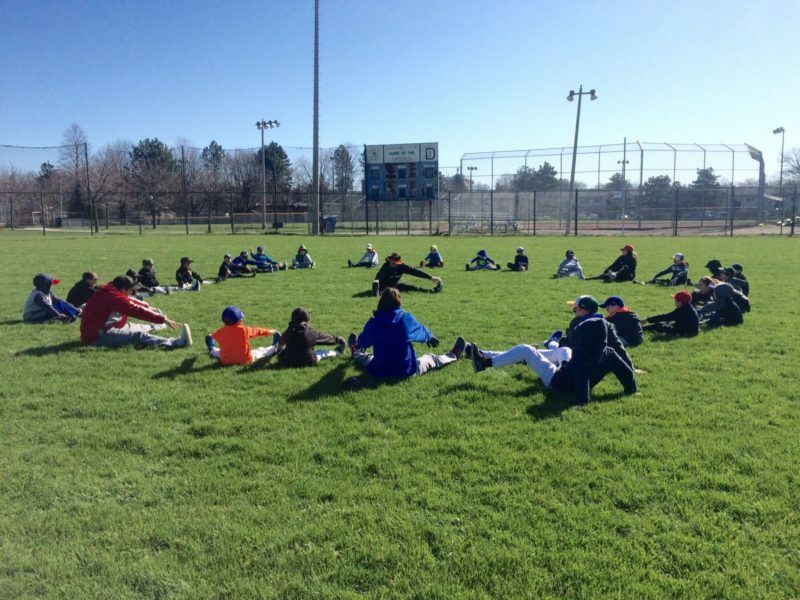 Our baseball spring training program is a weekend clinic that focuses on getting players ready for the start of their house league or rep season. Our instructors will teach the proper mechanics of hitting, fielding and pitching and provide every player with ample opportunity to practice each skill through a series of high-energy drills. Below is additional information and a preview of the schedule! From defence to pitching, and hitting to base running, our baseball spring training campers will have a chance to review the fundamentals and receive a high volume of repetitions. 8:30-9:00am Drop Off Parents will drop off their children and short activities will take place until camp begins at 9:00am. 9:00-9:15am Warm Up Coaches will lead a run and dynamic stretching. 9:15-9:45am Throwing Coaches will review mechanics and teach the proper way to warm up your arm. 9:45-10:45am Stations Hitting Stations (Saturday) – Campers will rotate through various hitting stations including live batting practice, soft-toss, and batting tees. Defensive Stations (Sunday) – Campers will rotate through various defensive stations including infield, outfield, and pitching. 10:45-11:00am Break A quick water and snack break will be taken. 11:00am-12:00pm Stations Groups will continue rotating through their stations. See 10:00 – 10:45am for details! 12:00-1:00pm Lunch Campers must bring a lunch each day (nut free!). After finishing lunch, campers will participate in organized lunch activities. 1:00-2:15pm Team Concepts Coaches will review team concepts including cut-off plays, base running, and run downs. 2:15-2:30pm Break A quick water and snack break will be taken. Tournament On Saturday campers will be divided into teams each coached by an instructor. During the games, instructors will pause to discuss strategy and positioning. 3:30 – 4:00pm Pick Up Camp ends at 3:30pm. Parents are welcome to pick up their children between 3:30 and 4:00pm. Get ready for the start of your season! If you didn’t have a chance to play indoor baseball over the winter or go to the batting cages, you’ll likely be a little rusty heading into your first official game or practice. Spring training gives you an opportunity to warm up your arm and take a few swings so you’re ready to go when the season starts. In the past, we’ve had several coaches sign up their teams for baseball spring training as part of their season-long program. It’s a fantastic way to not only practice team concepts – including cut-off plays, pitcher fielding practice, and situational hitting – but also to give players a chance to bond throughout the weekend. Click here for additional details about Spring Training and feel free to contact us with any questions or concerns: info@truenorthcamps.com or 416-619-1224.